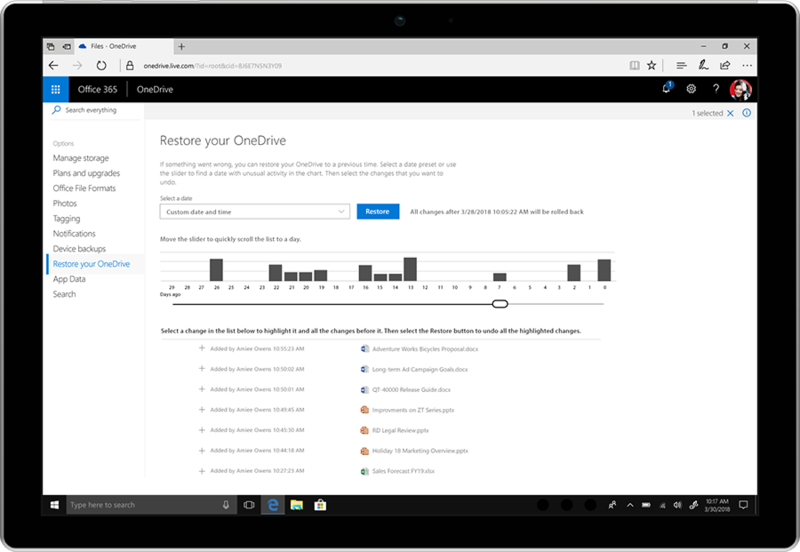 Microsoft at its Ignite conference last fall announced a new OneDrive for Business feature that would enable users to easily recover files following catastrophic events like mass deletes, corruption or other data loss scenarios. The handy feature started rolling out in late January and now, we’ve learned that it’s also coming to OneDrive for Office 365 Home and Personal accounts. With Files Restore, it’s possible to restore you entire OneDrive to a previous point in time – as far back as 30 days. Kirk Koenigsbauer, Corporate Vice President for Office, made the announcement on the official Office blog on Thursday. In the post, the executive also revealed that Office 365 can now detect ransomware attacks. If an attack is detected, Microsoft will alert you through desktop, e-mail or mobile notification and guide you through the recovery process. It’s here that you’ll find the date and time of the attack pre-selected in Files Restore, facilitating the restoration process. In an effort to help keep private documents from falling into the wrong hands, Microsoft is additionally adding password-protected sharing links, e-mail encryption for Outlook.com and a prevent forwarding option that restricts your e-mail recipients from forwarding or copying messages you send from Outlook.com. Building on the advanced link-checking and attachment scanning in Outlook.com announced in October, Microsoft later this year will add a feature to Word, Excel and PowerPoint that checks links you click in real-time to determine if they are malicious. If a link is suspicious, users will be redirected to a warning screen.